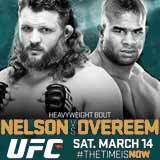 Review by AllTheBestFights.com: 2015-03-14, some good exchanges between Alistair Overeem and Roy Nelson but it is not enough to get three stars: it gets two. The former Strikeforce and K-1 Hw champion Alistair Overeem entered this fight with a professional mma record of 38-14-0 (92% finishing rate) and he is ranked as the No.8 heavyweight in the world (currently the #1 in this division is Cain Velasquez) but he won just two out of his last five bouts: against Frank Mir (=Overeem vs Mir) and Stefan Struve (his last fight, Overeem vs Struve). Between these two fights he lost to Ben Rothwell (=Overeem vs Rothwell). His opponent, the 38-year-old (4 years older than Overeem) and black belt in Bjj Roy Nelson, has a record of 20-10-0 (90% finishing rate) and he entered as the No.13 in the same weight class but he lost three out of his last four fights. ‘Big Country’ Nelson fought twice in 2014 beating Antonio Rodrigo Nogueira (=Nogueira vs Nelson) but then he was defeated by Mark Hunt (=Hunt vs Nelson). Overeem vs Nelson is on the undercard of Anthony Pettis vs Rafael dos Anjos – UFC 185. Watch the video and rate this fight!